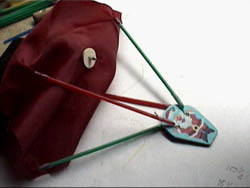 My purpose for making the parachuters was two-fold; complete a couple of 10 1/2 sets I had without parachutes and prolong the lives of the 45+ year old ones I did have, especially when "carefully handled" by my 4 year old. One of my sets has my 4 year old son's name on it for a future Christmas. 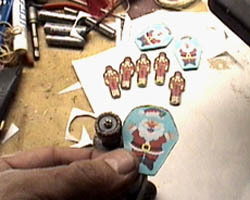 Why not keep with the holiday theme and make some "Santa-chuters"? I made them with the traditional and the holiday scheme so both files are available for printing. 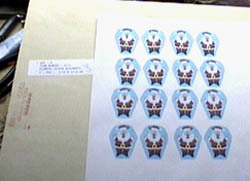 One note on the Santa version: the pattern is not quite symetrical so there is a front and a back. 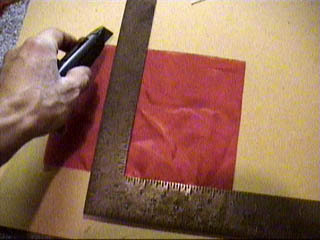 1/16" plywood: (see local hobby shop or Tower Hobbies on line) 1' x 2' sheet should make at least 100. 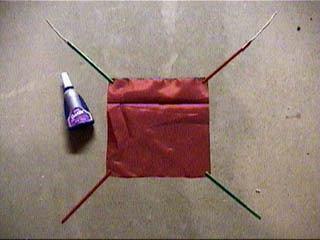 Nylon sheer fabric: used for the chutes, use about the sheerest you can find. One yard should be plenty. Pop rivet (1/8" aluminum): used to rivet the washers together at the top of the chute. 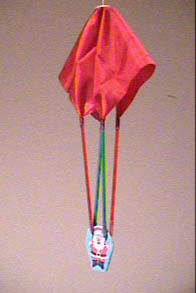 The struts and two 2" lengths of string are super glued to the parachute. Overlap the struts about 3/8" onto the chute. 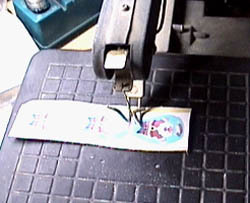 Overlay the string about 1/2" - nothing too critical here. 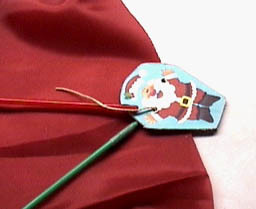 Wrap the joints with a piece of scotch tape for reinforcement. I used a 3/8" (cut a standard width down the middle) wide by 1" piece for the wrap. 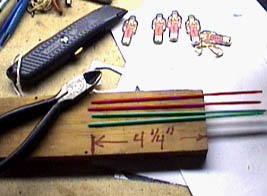 Glue the string to two adjacent struts; they will be glued to the opposite side struts after the string is fed through the parachuter's body. Cut a small hole in the center of the parachute and pop rivet the two washers together; one on the top and one on the bottom with the parachute material in the middle. 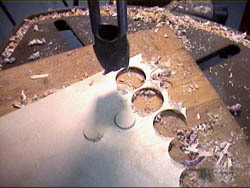 After pop riveting, drill out the mandrel head of the pop rivet with a 3/32" drill to form a through hole. That's it, you just made an Amusement Park parachuter!